Thanksgiving Day 2014 is gone. So's the bird. And the cranberries. But the good feelings linger on. The holiday started with my wife, Nancy Fox, and I in our hot tub splitting 20 minutes of spontaneity itemizing what we're grateful for. Although I'm sure we each could have gone on for at least another 20 minutes, we decided to stop at an emotional peak. 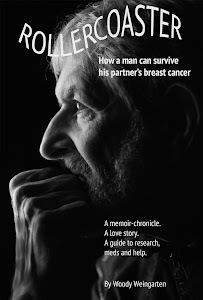 And only once did I feel a need to refer to this marking my partner's 20th year of being free of breast cancer (a subject I cover thoroughly in my new VitalityPress book, "Rollercoaster: How a man can survive his wife's breast cancer"). Midway through the day, we added to the warm 'n' fuzzy sensations. We traveled to Whistlestop, a San Rafael facility that provides transportation, programs and meals for seniors, the disabled and the poor all through the year — not to mention a special lunch with all the trimmings on Turkey Day. Nancy played background piano for 90 minutes. I'd checked with each diner and volunteer for his or her favorite tunes, then handed the lists to my wife. She easily rendered each one (because she miraculously retains thousands of tunes in her mind, and plays them all by ear). Heads bob. Bodies that may otherwise be bent with pain sway comfortably. Toes tap. It's ecstasy for the two of us to be able give back this way each year. And it was an unexpected pleasure to see our photo on the online cover page of the Marin Independent Journal, our local daily newspaper, accompanying its story of the meal. Then, a family dinner for seven happily topped off a flawless Thanksgiving. • Nancy, my soulmate, wife, friend and companion who supported "Rollercoaster" even when it crossed the line of intimacy and took forever to finish. should write a book — though I suspect he would have preferred a less weighty volume. • Matilda Weingarten, my mother whose immense strength I failed to see until her final years. • Janis L. Brown and Mark D. Weingarten, my daughter and son, who consistently gave me love and admiration, even when I occasionally handed them inflexibility. • Zachary Weingarten and Drew Brown, my grandsons, and Hannah Schifrin, my granddaughter, who have brought me pleasure upon joy upon delight. • Laura Schifrin, Hannah's mom, who generously sanctioned tons of time — which meant gobs of fun — for me to spend with her effervescent kid. 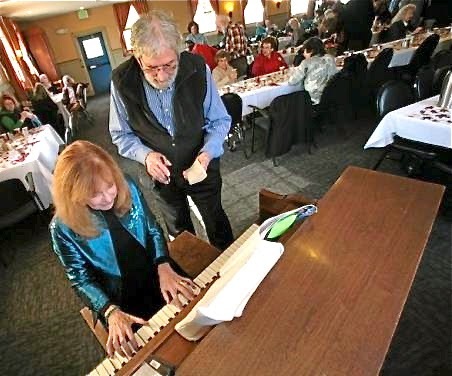 • Marv Edelstein, Dan Goltz, Heinz Feldman, John Teasley and the other Marin Man to Man support group regulars and drop-ins who for decades endured my incessant chatter. • Edward Marson, whose artistry is responsible for the graphic design of my book's covers; Larry Rosenberg, whose photo made me more pensive than ever; Alan Babbitt, whose back-cover shot lovingly captured Nancy and me lovingly staring at each other; and Wayne Heuring and Steve Cook for proofreading and copy-editing "Rollercoaster" and making me look at every word, especially a few tortured metaphors and similes. • Charlie Durden, a friend I will always miss, who vanished from my life one day into the L.A. smog, and died. 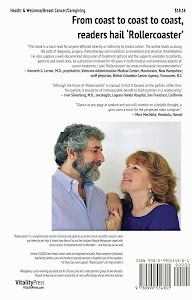 helped me and Nancy through the breast-cancer years (as well as after and before). And, last but definitely not least, each and every caregiver and patient who's been forced to ride in a cancer rollercoaster.